ROXY Wants You to Dare Yourself! Following the success of last year’s "Let The Sea Set You Free" contest, Roxy continues its quest to find inspiring and creative ladies who aren’t afraid to make their mark. Being a women-empowerment brand, Roxy, a division of Quiksilver, Inc., launched a global social media campaign to invoke the spirits of women and challenge them to push the boundaries and embrace a carefree life. Roxy's contest last year inspired Filipinas all over the country. With 71 unique and one-of-a-kind entries sent in the course of four months, five young ladies were hailed as the finalists to represent the country for the global contest. This year, Roxy invites Filipinas once again to express themselves and get a chance to win a trip of a lifetime together with Roxy pro-athletes, monetary prizes, and tons of Roxy apparel. The globe will be divided into five regions namely, North America, Latin America, North Asia, South Asia and Europe, Africa, and the Middle East. This contest already started last January 25 and will run until June I think (check Roxy's page to be sure). 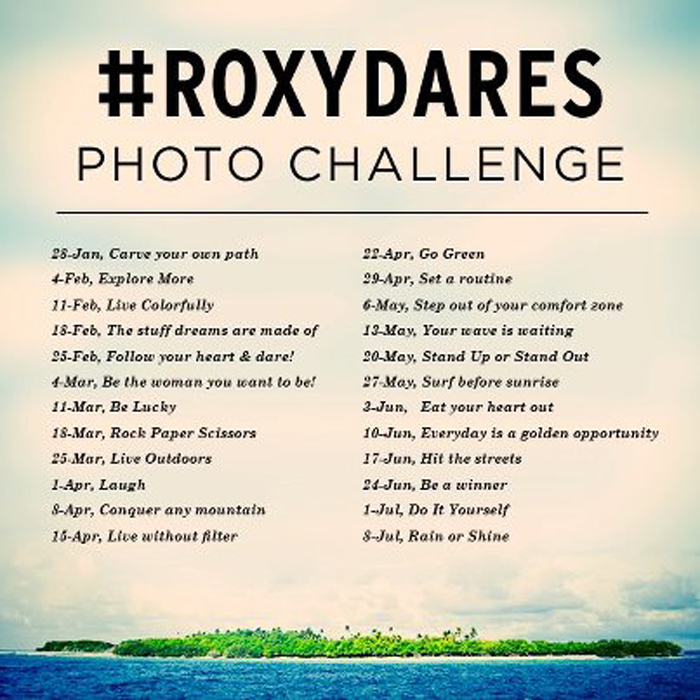 Ladies aged 18 to 28, from all corners of the Philippines are invited to enter the Dare Yourself contest on Roxy’s Facebook page. Submit a 150-word essay, and three photos or a one-minute video outlining how you “dare yourself” to dream big, lead a unique lifestyle, and carve your own path. On March 29, users will get to vote via Facebook to narrow the entries to their top 150 favorites. A panel of Roxy judges will then choose ten finalists per global region, who will be asked to create a video challenge. The global judging panel will choose five winners and one winner per global region. So what are you still doing there sitting infront of your computer? Go out and be a Roxy girl! Then photograph / film yourself while you're at it. You just might win big this year! 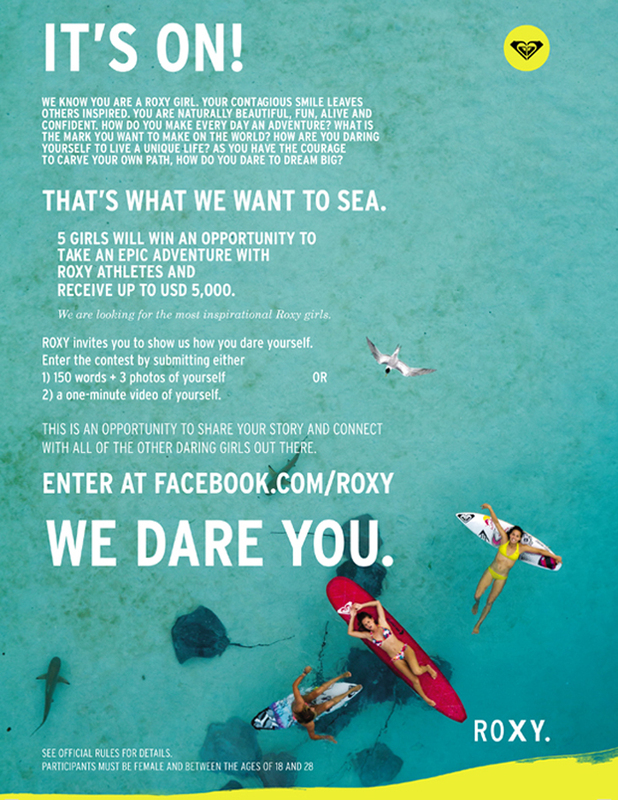 :) Be a part of Roxy’s campaign to ignite the spark in each young woman all over the globe. Dare yourself to dream big, lead a free-spirited lifestyle, influence others, and make your mark. Because remember, you only get to live once! YOLOOOOO! Follow Roxy Philippines on twitter, www.twitter.com/roxyphl, and like us on Facebook, www.facebook.com/roxyphilippines. The Primer Group of Companies, Asia’s next retail giant, is the exclusive distributor of Roxy in the Philippines. ah i've always dreamt of surfing! !